This is where you will find my lame attempts at doing things myself. Lucky for you I have no original ideas as of yet. Therefore, the title of each "demonstration" will be the link that told me how to do it. Happy doing it yourself! Martha's is way cuter than mine. Seriously though, this was by far the cheapest and easiest thing I have ever made. 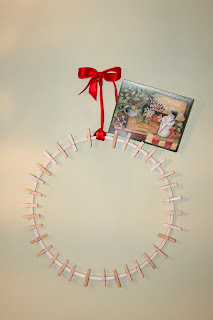 You need a hot glue gun, festive ribbon, mini clothes pins, and an embroidery hoop. Hot glue the pins to the hoop. I have far more than Martha...I got carried away. Tie your ribbon, make a bow, and hang. I love this! It's so hard to find a good way to display all the cute cards you get every year & this is adorable!